We have been an active supporter of the local community since 1982, supporting and sponsoring a diverse range of local initiatives including sporting clubs and charities. In recent times we're particularly proud of our involvement in founding annual charity day events in both Victoria & New South Wales, raising in excess of 2 million dollars of much needed funds for local hospital, cancer research & community support networks. Running for several years Evergreen Turf began an annual charity day to support local hospitals, cancer treatment and charity groups. Originally founded at Hawkesbury Racecourse the event has grown in size and stature every year with this years event held as a stand alone metropolitan race day at Randwick Racecourse. With the support of turf industry participants across the country we are proud to have raised millions of dollars throughout the events history with over $400,000 raised in the recent Randwick event alone. Founded in 2015, Evergreen Turf hosts an annual charity twilight race event at the Pakenham Racing Club to provide support for local community groups as well as industry participants. Local beneficiaries have included the National Jockeys Trust and in more recent times the Casey Cardinia Foundation - who raise funds and encourage philanthropy to provide grants to support communities across the shires. 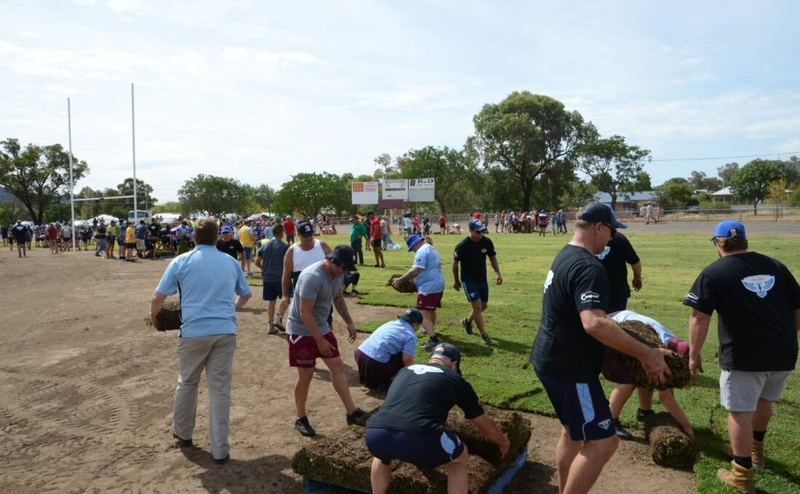 A fantastic initiative in conjunction with the Hogs for Homeless that sees Evergreen Turf annually donate and volunteer services to a chosen rural township to upgrade their local sportsfield. Recently Evergreen Turf re-surfaced the playing surface at Wellington, NSW, with full involvement from the local community and user groups. Run in unison with the Hogs for the Homeless annual motorcycle drive Evergreen Turf donated all turf, machinery and labour to rejuvenate this local sporting ground in an engaging & positive manner. Evergreen Turf are proud sponsors of a number of local sporting teams, clubs, industry events and community initiatives. Our involvement in the racing industry has seen us sponsor numerous races annually across the country at racecourses including Caulfield, Ballarat, Randwick, Pakenham and Mornington. We were also proud sponsors of the Brisbane Cup for consecutive years.